Everybody loves a good garden. 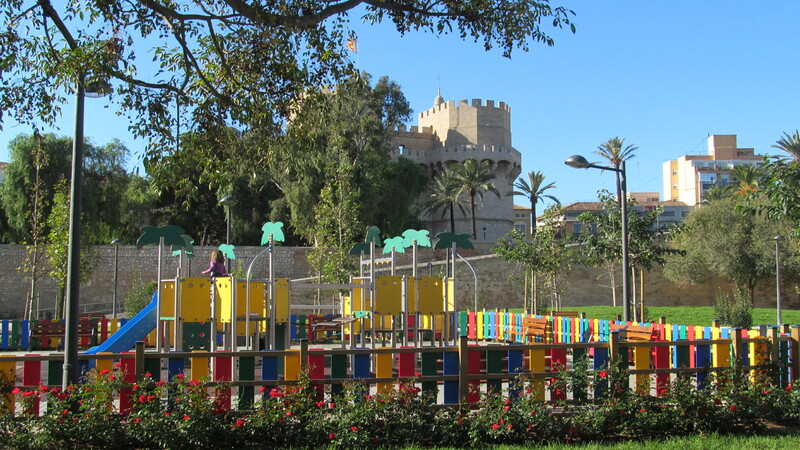 I had heard good things about Valenica, but I had no idea how beautiful a city it is. I arrived yesterday (Hallowe’en) in the early afternoon by train, along the Mediterranean coast. I was almost immediately entranced by its beauty, its panache, the vibrant life in its streets and plazas. It is smaller, its medieval neighbourhood more self-contained, its northern and eastern borders embraced by nine kilometres of parkland, serpentining through the city. In 1957, the city was devastated by very high floods from its river. The solution was to divert the river west and south of the centre in a safe, easier-to-control channel. What to do with this empty riverbed? Some wanted a freeway to the port. Fortunately others prevailed and now it is a continuous sunken parkland with numerous amenities, playing fields, jogging paths, skateboard parks, oodles of room for picnicking, hanging out and beating the heat. 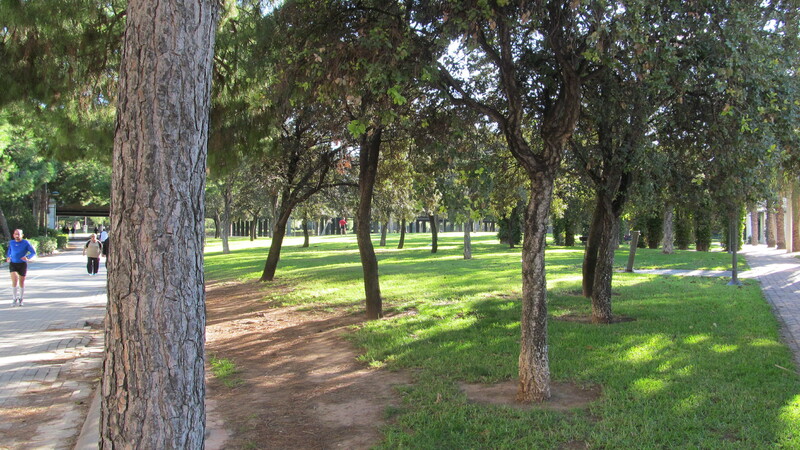 Los Jardines de Turia. 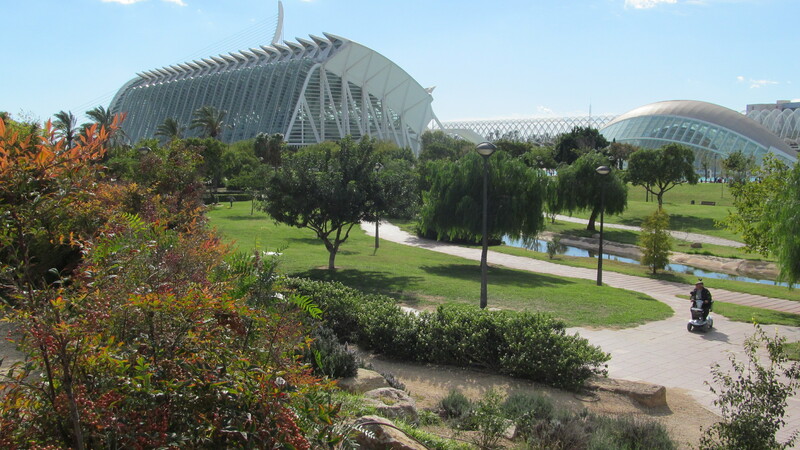 The Gardens of Turia. Today was a gift; twenty plus degrees, full sunshine with a breeze from the Mediterranean. I walked most of the Turia in two chunks. My hotel is located on the northern bank about 3 kilometres from one of their ancient fortified towers, a perfect entrance to the old city. The second photo is of this tower from the park, with the contemporary peaceful towers. 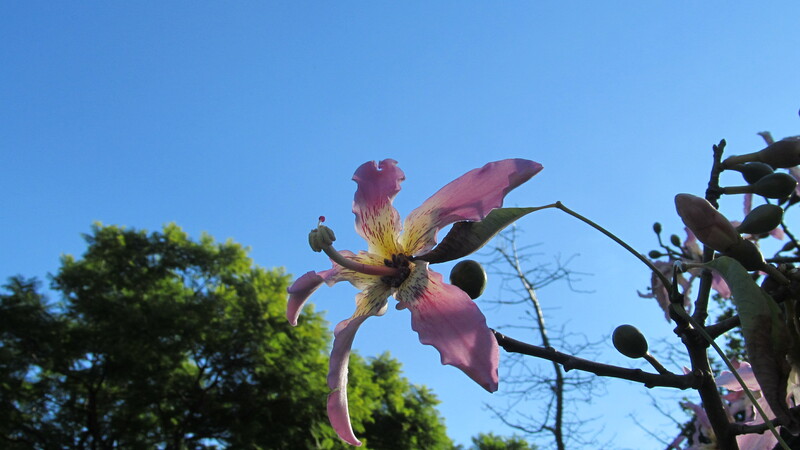 The third is of a blossom on a tree, from one of number grouped together. I have to find out its name. I have never seen a more beautiful blossoming tree, and in November no less. I will let you imagine half a dozen of these trees covered with this bloom. Here is another photo of that tower from the level of the gardens; the bridge gives an idea of the gardens’ floor in relationship to the city. I did explore the old town, its narrow streets, innumerable outdoor cafes and restaurants, its ever-present street life, large and tiny plazas, and many other memorable buildings. Another blog! I want to stay in this park. I want to introduce you to Goolyba-ray. Think of our wonderful climbing community-built playground, and take a quantum leap. 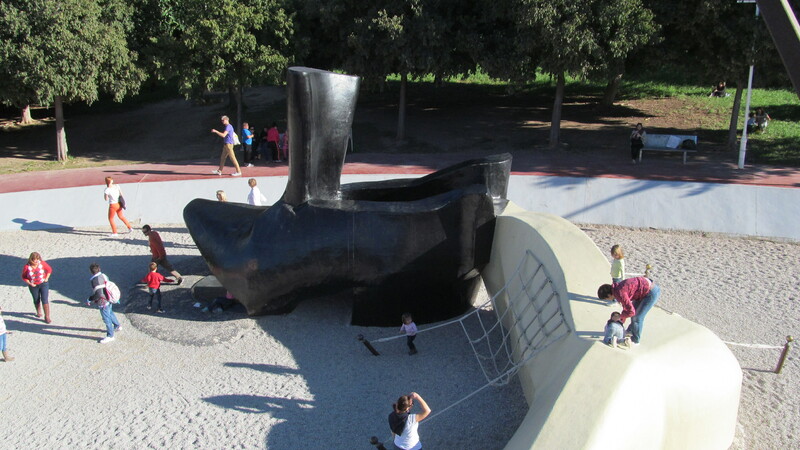 See the fingers of the right hand and then the arm, the right thigh somewhat raised, see the children climbing, sliding, exploring, enjoying endless fun; this is a gigantic human figure – in Spanish, Goolyba-ray. 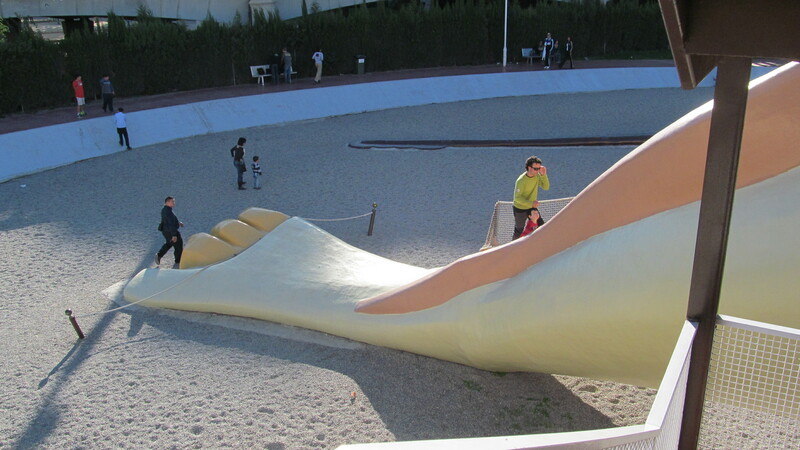 In English, Gulliver. What a stroke of genius! And it’s in Turia. Here is his head. That pale green thing rising and flowing to the right would be his cravat, I suppose. 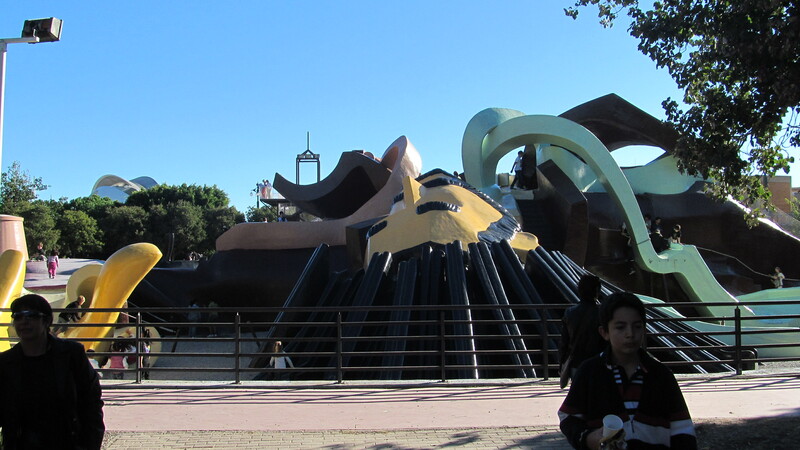 And he still retains one of his boots in spite of the shipwreck he has just endured. What an appropriate subject for a city that has lived beside the Mediterranean since 138 BCE. Nine kilometres of sunken pleasure grounds. My hotel was located within half a kilometre of the western end. This is what welcomes valencianos and tourists at the other end. The City of the Arts and Sciences, a permeant collection of space-age buildings designed by a homegrown architect. A subject for another blog; likewise their beach and their food. I wanted to stay in the park. 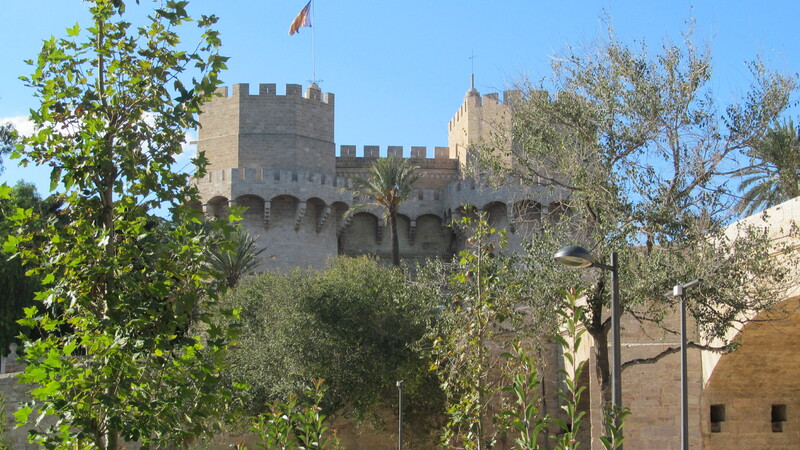 I imagine living beside the Turia, walking it to my favourite cafe in the morning, what an alternative! to shop at their mercador central, 900 stalls of every kind of produce, to meet up with friends at one of their amazing restaurants or museums, to simply enjoy the outdoors, to practice Tai Chi, Valencia was almost too easy to fall in love with! Valencia is almost impossible not to see again. This entry was posted in Uncategorized on November 3, 2012 by agnotarte. WOW!!!!! I want to go to Valencia!! I want to go to Valencia!!! I want to go to Valencia!!!! Bob tus comentarios Dan ganas de ir inmediata entre a Valencia. Mil gracias por tus interesante puntos que anotas en cada descripción. Abrazos. Yes, I simply love being here for a few weeks at a time. I have met more and more of the people. I have made great strides with the language. I feel that I will never tire of her charms. I went to see Barca play this early evening, 80,000+ fans. Had good conversations with those around me – loyal culés. A few more days and then I am home. I do look forward to getting home. I love both places.